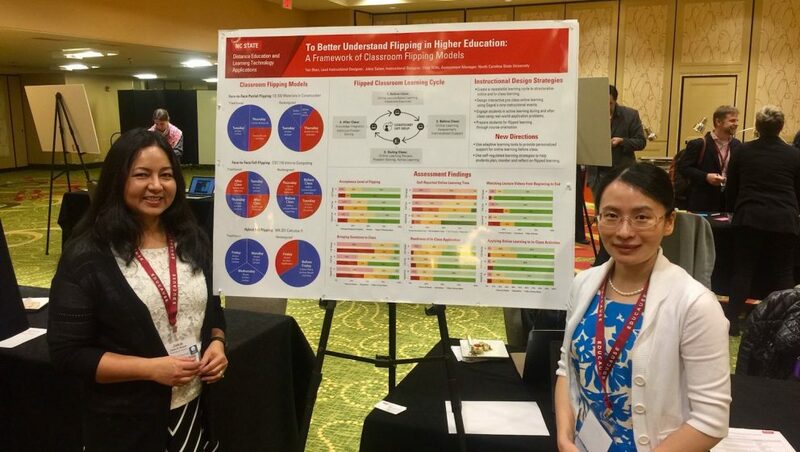 Jakia Salam (left) and Yan Shen (right) presented their work on classroom flipping models at the ELI Annual Meeting in January 2018. Members of the DELTA team were fortunate to attend this year’s EDUCAUSE Learning Initiative (ELI) Annual Meeting in New Orleans, Louisiana, this past January. DELTA members included a group of instructional designers and technologists Yan Shen, Jakia Salam, Rebecca Sanchez, Bethany Smith, Christopher Beeson and Arlene Mendoza-Moran. ELI focuses on advancing learning through information technology innovation, and that was evident by the session themes and topics throughout the conference. Active learning, adaptive learning, VR/AR and faculty development strategies were some of the pervasive themes throughout the sessions. Session types varied from presentations to poster sessions. Understanding Classroom Flipping Models poster presentation. This was a great opportunity for the members of DELTA to reflect on our own projects and strategies as well as share our own expertise. Yan Shen and Jakia Salam represented DELTA well with a poster titled “Understanding Flipping in Higher Ed: A Framework of Classroom Flipping Models.” Aligned with the conference theme of “Achieving Student Success through New Models of Learning,” this poster focused on three classroom flipping models that integrate lecture-based online learning and active in-class learning. 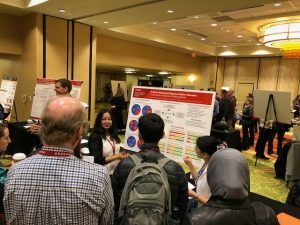 It also presented instructional design strategies applied across the models and shared preliminary findings of student attitude, learning behavior and learning perceptions. Several sessions included active learning as part of Universal Design for Learning (UDL). UDL is an educational framework that seeks to improve accessibility, active learning and flexibility in courses in an effort to “optimize teaching and learning for all people-based on scientific insights into how humans learn.” A team composed of a UDL expert, an administrator and an instructional designer from the University of Tennessee-Knoxville shared different perspectives of implementing the UDL Guidelines on their campus. Another presenter shared resources and strategies (including teaching tips, videos and one-page recommendations) that helped to get buy-in for UDL from stakeholders at multiple levels at Oakland University. 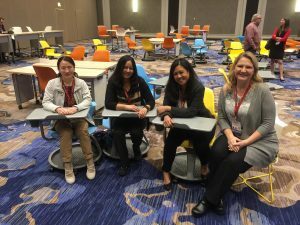 Left to right: Yan Shen, Jakia Salam, Arlene Mendoza-Moran and Rebecca Sanchez between sessions at the ELI Annual Meeting. Adaptive learning was one of the major themes at the conference. We attended sessions about using adaptive learning models and tools to allow students to learn at their own pace. In one of the sessions, Colorado Technical University and University of Central Florida shared experiences and findings of using adaptive learning in their online courses supported by Realizeit. They jointly collaborated with Realizeit and developed several adaptive, self-paced courses. Students liked the feedback and lessons tailored to their test results and became more proactive to learn. However, they also reported less interaction with peers and would like better accommodation of application. There were several sessions related to immersive learning or VR/AR. In a session presented by educational technologists from Hamilton College, New York, pointed out that narrative storytelling is now becoming more popular. The cost for this has gone down and now millions of virtual reality headsets are available to students and teachers. Teaching and learning is now possible using 360-degree pictures/videos or 3-D models. New VR/AR platforms are empowering faculty and students as creators, they are creating a virtual world around them to tell their story! The major theme for VR/AR was storytelling, this will change the way you tell your story in the future. One of the most impressive projects they presented was “Dream a Little Dream: Virtual Realities in Literature.” This course “introduces students to the representation of virtual worlds in literature, and how these ‘dreamscapes’ have transformed our understanding and experience of the ‘real’.” The students create virtual realities of their own, familiarizing themselves with the technology to do so. They also used 3-D audio to develop an immersive musical experience. There was a lot of focus on making educational movies in VR along with the best practices to use VR/AR in the classroom. The discussion focused on the investments in people, technology and resources to leverage the capacity of VR/AR to create transformative change for student success. Sketchnote by Bethany Smith from ELI Annual Meeting. 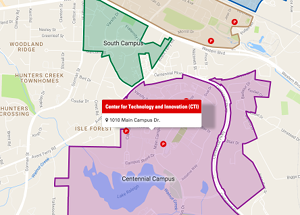 For the Instructional Technology members of the team, Bethany Smith, Christopher Beeson and Arlene Mendoza-Moran, learning about Faculty Development initiatives at other universities was a crucial experience. 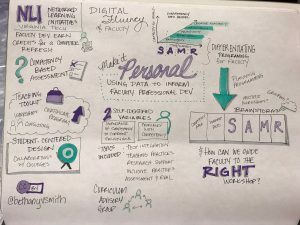 Virginia Tech shared their experiences creating a Faculty Development Model that was competency-based and followed the Substitution, Augmentation, Modification, Redefinition (SAMR) framework for scaffolding faculty and instructors. The California State University System hosts a Summer Institute annually, similar to DELTA’s Summer Shorts program, and provided an insight into running a system-level institute that is cohort-based. In a triple-threat session, Northwestern University, the University of Wisconsin-Madison and Purdue University shared the “Secret Decoder Ring for Faculty Development, “which focused on the issues faculty face in improving their courses (both online and in-person) as well as barriers to success. It was invaluable to see commonality amongst faculty developers and ways to tackle current issues. Overall, the ELI Annual Meeting was extremely beneficial and we are excited to see the new projects and ideas that are inspired by those that attended. Article compiled from DELTA attendees Yan Shen, Jakia Salam, Rebecca Sanchez, Bethany Smith, Christopher Beeson and Arlene Mendoza-Moran.